The early 1960s. The pinnacle of male style, when men treated each activity, accouterment and debutant with sophistication and taste. But the two ambassadors of swinging sixties charm were also two of the Cold War’s coldest warriors. Both were boarding school boys turned navy officers, men who rose in rank to the heights of government service. They were the sort of men all others envied, and all women pined for.They were men of legendary libidos, womanizers worthy of even Don Juan’s envy. Both travelled the world, wooing and winning the world’s most gorgeous women in the lap of luxury, while also facing down some of the most nefarious villains of our times. Their way with women was matched only by their way with words, wit, and whimsy. With a wink and smile these two men pulled the world from the brink of Nuclear Annihilation time and time again. These two men, are of course Secret Agent James Bond, and President John Fitzgerald Kennedy. 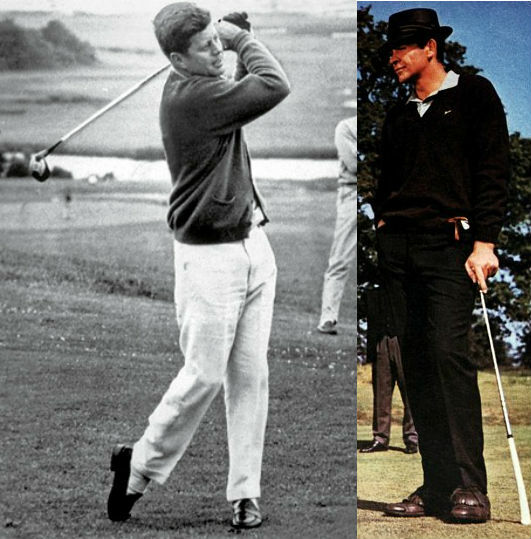 Two men who need only be known by three characters, JFK & 007. These days, everyone in America knows who James Bond is. The character and his franchise are pervasive and vastly influential in all spheres of popular culture, from movies, to video games, comics, novels, toys, and TV. At first, James Bond wasn’t particularly popular in the United States. 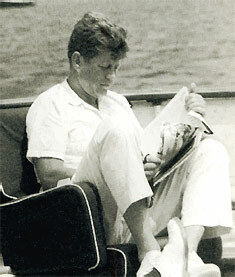 That was until President Kennedy listed From Russia with Love as one of his favorite books. After that ringing endorsement, Ian Fleming’s James Bond books started flying off of the shelves. Though JFK and 007 shared a similar style, wit, charm, and taste for the good life, the connection between the two icons goes far deeper than cosmetic comparisons. We often think of James Bond stories as being influenced by world events, but what is startling to realize is that in many ways, the opposite is true, and that the James Bond novels changed the course of history.After finishing the novel From Russian With Love, JFK passed it on to Allen Dulles, head of the Central Intelligence Agency, America’s M.
The summer before his election, Jack Kennedy invited Ian Fleming over to his estate and asked the novelist how M and 007 would take out Cuban Dictator Fidel Castro. Fleming suggested three plans. When JFK became president, the CIA acted on all three of these proposals. So the leader of the free world and the head of its largest intelligence agency were conducting foreign policy based on James Bond novels. Ian Fleming was not only writing the greatest literary character in history. He was literally writing history. The secret agent chosen to whack the beard was William King Harvey. A womanizing boozehound who always slept with a gun under his pillow, when Kennedy first met Harvey the President remarked, “So you’re our James Bond?” The CIA let their agents run wild in Cuba with ridiculous missions and ridiculous operational funds. The CIA was chock-filled with James Bond wannabes such as Frank Sturgis, and E. Howard Hunt, who was himself a secret agent novelist. Meanwhile, the James Bond novels were having a huge impact on another young man, Lee Harvey Oswald. He too was a fan of the novel From Russia With Love, a story of political defection that oddly mirrors Oswald’s own defection to the Soviet Union. 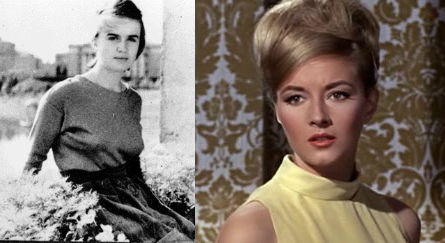 In the story, James Bond wisps the young Russian Tatiana Romonvav across the iron curtain with promises of decadent western luxuries.While in Russia, Lee Oswald similarly swept young Marina Prusakova off of her feet and brought her to America with promises of a better life. But when things started going badly, Tatiana and Marina realized that perhaps they were in for more than they had bargained for. If JFK represents all the most charming aspects of James Bond, then perhaps Lee Oswald is a reflection of his dark side. His rages, his wrath. The irony inherent in any substantive comparison of JFK and 007 is inescapable. For while James Bond is a timeless figure, JFK was a figure taken before his time. And while James Bond is unkillable, we all that the same cannot be said of Jack Kennedy. And yet, the tragic assassination of President John Fitzgerald Kennedy on in Dallas Texas on November 22nd 1963, is oddly paralleled in the life and times of James Bond 007. 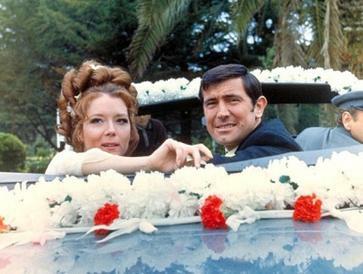 In the novel and film On Her Majesty’s Secret Service, James Bond’s marriage to Contessa Teresa Vicenzo ended in the same way as Jacqueline Kennedy’s marriage to Jack. Just as Jack Kennedy was gunned down by a hail of assassins bullets in his car, so too was Teresa Bond. Just as Jack Kennedy’s lifeless body fell into Jackie’s lap, so too did Teresa. They say that once the Presidential limousine reached the hospital, Jackie Kennedy refused to let go of her husband’s body, even as other’s entreated her to do so. And when all hope was lost for Contessa Teresa Bond, James Bond too refused to let go. On Her Majesty’s Secret Service was published in April of 1963, mere months before the assassination. In life, JFK was as physical manifestation of the James Bond lifestyle. The luxury, the charm, the wit, as well as the arrogance and bravado. In death, John Kennedy transcended his status as a historical figure and became a timeless cultural icon of the 1960s, rivaled in prominence by perhaps only James Bond himself. In the turbulent political atmosphere of the 1960s, people turned to the gleeful escapism of James Bond to pull them through the harsh realities of an increasingly complex world. Jack Kennedy did. And now the world needs James Bond again. His enemies are invigorated and reborn. But so too, are his allies. Through tragedy, James Bond lost his naiveté. But so too has the nation, and indeed the world. A world that needs heroes like James Bond now more than ever. But 007 is up to the challenge, for he is a man who lives by the credo: “Ask not, what your country can do for you, but what you can do for your country. Nice comparison! Maybe we can conclude and backtrack from the number of bullets in James Bond’s wife to the number of bullets on Dealey Plaza? Well it always bothered me that even though Tracy is shot from the side, there is a bullet hole in the front of the car. Continuity error or second gunman? Thanks for reading everybody. Hope it steers some readers your way. Interesting.. The likenesses between the two is uncanny.. While I noticed many parallels between the two, you brought a few new ones to my attention. Great article – very well written.